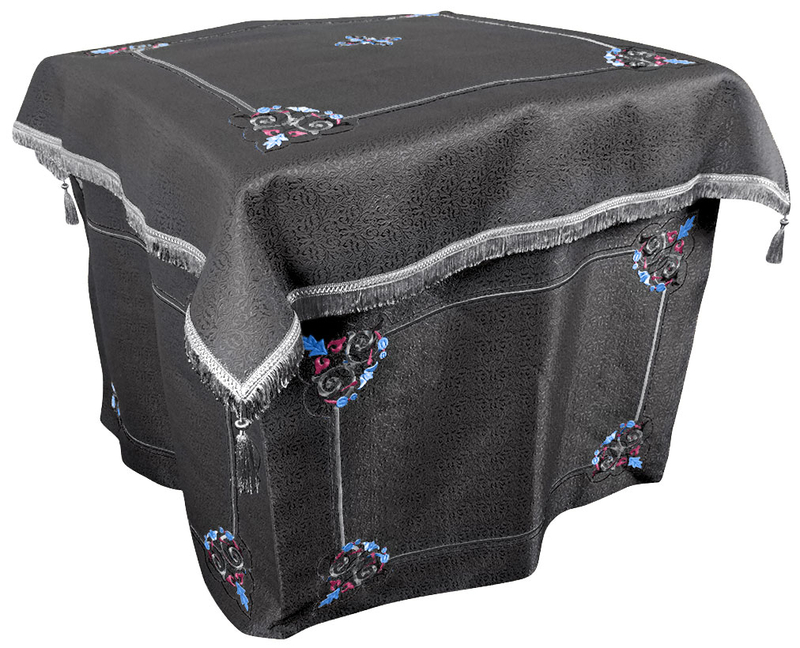 Orthodox Church liturgical Holy table vestments (black-silver) by Istok Church Supplies Corp.
Istok Church Supplies is committed to offering all kinds of Orthodox Christian church goods including altar cloths such as Holy Table vestments in traditional liturgical color combinations. 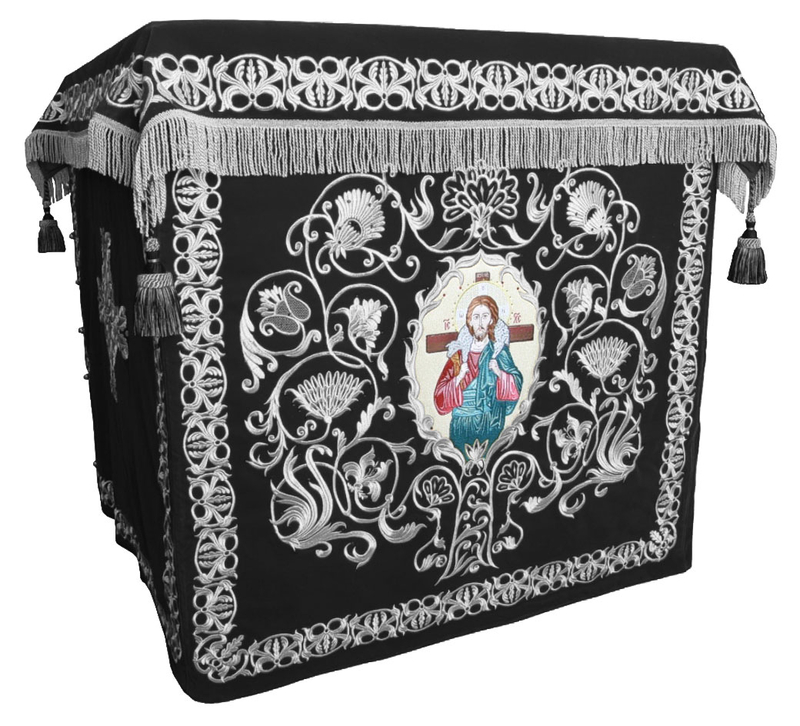 Our black-silver Holy Table vestments are made from the best ecclesiastical fabrics and can be customized to suit the needs of your particular church. We work with reliable cloth mills to source rich and lavish church fabrics which are essential for liturgical vestments. Our black-silver Holy Table vestments are available in three fabric choices – silk, brocade and embroidered natural German velvet. 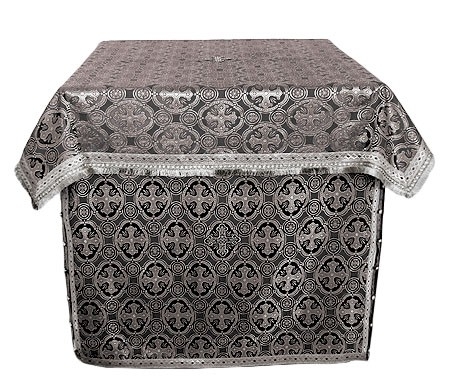 Holy Table vestments made from silk and brocade feature intricate patterns whereas vestments made from natural German velvet feature beautiful, Orthodox Christian embroidery. Customers have the option to select a product as it is or opt for a different fabric belonging to the same class. Some of the Holy Table vestments featuring embroidery are made from embossed natural German velvet while others are made from plain natural German velvet. We provide adornment in the form of galloon and customers who have the option to upgrade to premium quality decorations by paying a small additional fee. Customers can also add velvet inserts to their order with applicable charges. Holy Table vestments provided by Istok Church Supplies comply with traditions and are a great way to enhance the beauty and spirituality of liturgical worship. Although prices mentioned are for Holy Table vestments of particular dimensions, we welcome custom orders and offer made-to-measure services for different types of liturgical vestments. We request customers to provide us with the exact measurements of the Holy Table for which they want the vestments so that our experienced tailors can create perfectly fitting vestments. 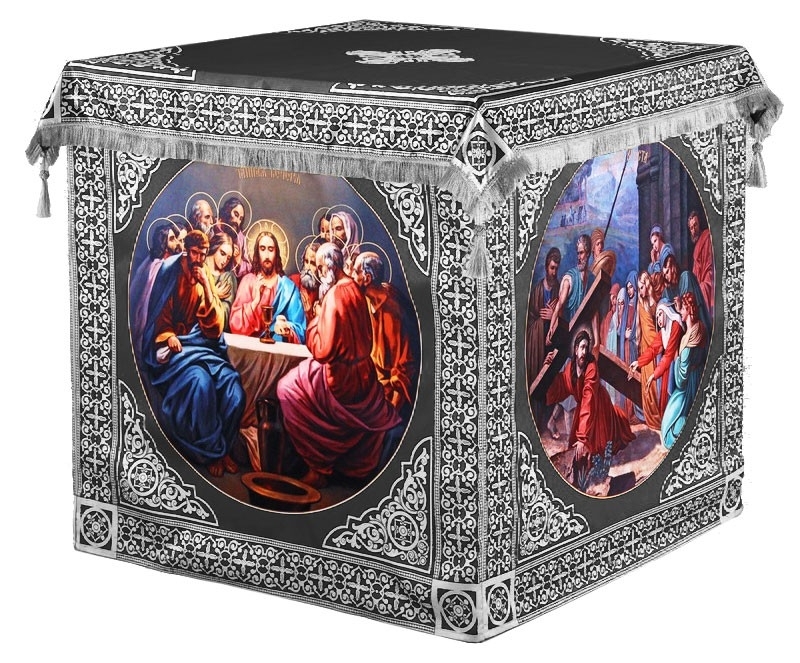 Enhance the solemn ambience of the Holy Altar during Lent by covering the Holy Table with a black and silver Holy Table vestment from Istok Church Supplies!